There are plenty of new ideas in Mickey's latest adventure, but is the design team playing it safe? Last November, a film archivist in Hertfordshire found an old tin sitting on a shelf. The tin was labelled "Hungry Hobos", and a quick check on Google revealed that it contained a genuine piece of movie history. It was an Oswald the Lucky Rabbit cartoon - he was the precursor to Mickey Mouse - made by Walt Disney's animation company in 1928, and long thought lost forever. A copy of the film travelled with Junction Point boss Warren Spector when he visited London last week to show off Epic Mickey 2: The Power of Two, the unexpected sequel to the odd and rather troubled, Wii exclusive from 2010. Spector screened it for us before launching into his game presentation - I wish all press events worked like this - and it was astonishing stuff to watch. When you think of Disney cartoons - I'm talking about the shorts, here, rather than the full-blown features - you may be picturing something that's lavish and beautiful, but rather tame and rather bloodless. Disney shorts tend not to be funny and violent the way that Warner Bros. cartoons are. They don't feel as subversive. Back in the days of Oswald, though, they were. Hungry Hobos - one of now just 14 of the original 26 Oswald cartoons to have survived - is refreshingly cruel, in fact. Oswald and Peg-leg Pete are hitching a ride on a train. They want something to eat, so they pull the head off a chicken and shake out a few eggs. To cook them, Pete holds Oswald against the train track until his pants catch fire. That's just the first scene. Gallery: Blitz Games is apparently working on the PS3 and 360 versions while Junction Point handles the Wii outing. Oswald used to be mischievous and anarchic, and so did Mickey Mouse. Disney cartoons were once brash, inventive, and even mean. You don't see much of that any more, but you did get a little glimpse of it in Epic Mickey. In the first game, in fact, Oswald spent a lot of time as the villain of the piece, a spurned and bitter cinematic icon left to wallow in the Wasteland, his toxic version of Disneyland, while some newcomer got all the attention. This was a Mickey Mouse game that kicked off with an attempted surgical disembowelling, remember, and things only got weirder and scarier from that point on. In the sequel, however - which is coming to the PS3 and Xbox 360 as well as the Wii - Oswald and Mickey are partners, and they're off on a new adventure that sees the Wasteland suffering strange seismic events that threaten to pull it apart. So that's the first thing that's changed, then: you've got local split-screen co-op that sees you teaming up, drop-in, drop-out style, throughout the entirety of the campaign. Playing on PS3, this makes for scrappy, rather chaotic fun. Mickey's still armed with his paint and paint-thinner, allowing him to rub out parts of the environment or build it back up again - on a pad, this is done with L2 and R2, with the right stick controlling the reticule - and Oswald has a remote control that he can either use to zap electrical equipment to life, or to throw and then catch, like a kind of boomerang. Co-operation's the order of the day, and plenty of the game's very early puzzles rely on Mickey clearing a path with his thinner while Oswald powers an electrical platform that will move them along some tracks. If you're playing with a friend, it can all feel pleasantly clumsy in a pantomime sort of way. If you're playing alone, meanwhile, the AI isn't bad, and it looks like you can switch characters with the press of a button. The adventure still seems to be split between 2D and 3D sections, and Spector's said that his goal is for players to make their way through the entirety of the main campaign without ever having to touch the camera controls, which are located down on the d-pad. The camera was a real issue back in the first game, but 20 minutes or so spent in the new version of OsTown, a large 3D space with a fountain right in the centre, suggests that the team is making noticeable improvements, even if there's still some way to go. The split-screen leaves both players with plenty of space to see the environment, and it feels a little easier to target NPCs for a chat. When platforming is called for, the camera seems to anticipate where you're trying to go, and it can even cope with a new special move in which Oswald's ears turn into helicopter blades and Mickey hitches a ride on his feet. In terms of objectives, the section we're allowed to play is not particularly inspired, however. After working through a quick tutorial in Yen Sid's workshop and navigating a floating path made of rocks, a 2D travelling level features a series of very simple door puzzles, while OsTown sees us locating three fuses to power a thinner pump that will drain the nearby fountain. It's early on in proceedings, of course, so it's probably wrong to expect too much in the way of excitement, but it's also worth remembering that, while Epic Mickey was always very good at taking you to amazing locations, it often didn't have anything particularly brilliant for you to do once you were there. Along with the multi-platform shift, Epic Mickey 2 promises to deliver on the sense of consequence that the first game often skirted. Here, according to Spector, the decisions you make will stick: they'll affect the Wasteland and the people within it, and will hopefully cause you to stop and think before making a choice. On top of that, the whole thing's now fully-voiced, while cut-scenes even see characters breaking into song as the story unfolds. Blitz co-founder Philip Oliver's first interview since the demise of one of the UK's longest-running developers. Spector's pretty excited about the song angle, as it happens, but he's also bringing it in with uncharacteristic timidity. While he suggests he's got plenty of ideas for how to make songs work within the actual moment-to-moment action of an Epic Mickey game, for this outing, they won't be escaping from the cinematics, where they can be easily skipped with the press of a button. It's a shame, really, even if it's easy to appreciate why Spector's being so restrained. 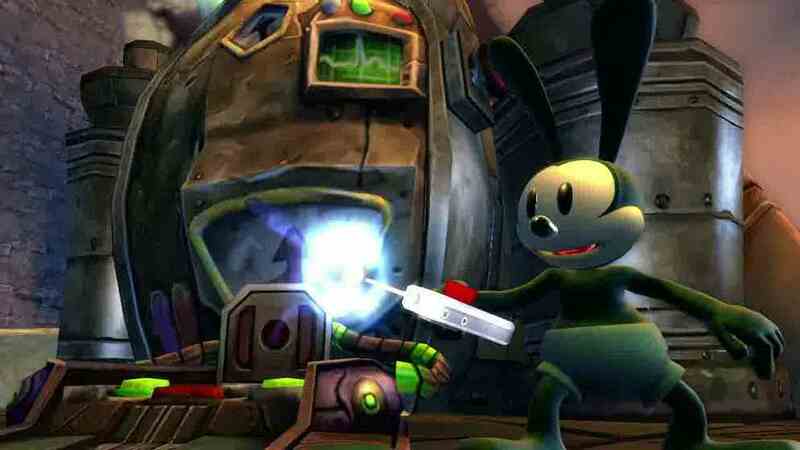 While the first Epic Mickey wasn't a gigantic critical hit, it was a courageous game that took huge risks with its subject matter, plucking good ol' Mickey Mouse out of his inane comfort zone and exploring the fascinating outer-reaches of his mythology, along with the mythology of the studio that created him. Epic Mickey 2 will hopefully continue in that tradition to some extent - I can't wait to see how the Wasteland has changed in this latest outing, for example - but by introducing its big new elements so cautiously, it may be passing up the chance to be just as bold and intriguing as its predecessor. After all, if you ever get to see Hungry Hobos for yourself, it will remind you just how inventive and forward-thinking Walt Disney could be sometimes.